Adventurer / photographer Chris Bray, now 27, living in Sydney, Australia, was born into a life of adventure - sailing around the world for 5 years with his family on their homemade yacht Starship. 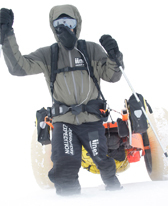 Since then, Chris has led various expeditions including world first journeys across unexplored parts of the arctic, Tasmania's untracked wilderness etc. 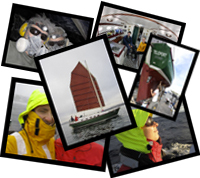 Sailing has remained a hobby, and together with some mates he sailed from Tasmania across the Southern Ocean to Chile, via the sub-Antarctic islands, working towards getting his celestial navigation qualifications. Jess is an experienced wilderness guide and keen photographer. Now 23 years old and living in Sydney, her first photography award kick started her passion in photography and being a young Girl Guide with a sash full of badges fuelled her obsession with the outdoors. Since then she has had photos published in 'National Parks and Wildlife' pamphlets, wedding magazines, Australian Geographic Outdoor and, partnered with Chris Bray, helps run photography courses all around Australia and New Zealand. Jess has also worked extensively with Australia's leading provider of experience based outdoor education, "Southbound Adventures".